Are you a Computer Science Graduate? Are you preparing for an Interview? Want to become a master in Data Structure? Well, Sorting algorithms are the most frequently asked questions in Java interview questions. Sometime back we have written an article on Bubble sort ascending and descending order. I remember learning Data Structures and Algorithms Selection Sort in my BE Computer Science degree course. Let’s implement the same today here. 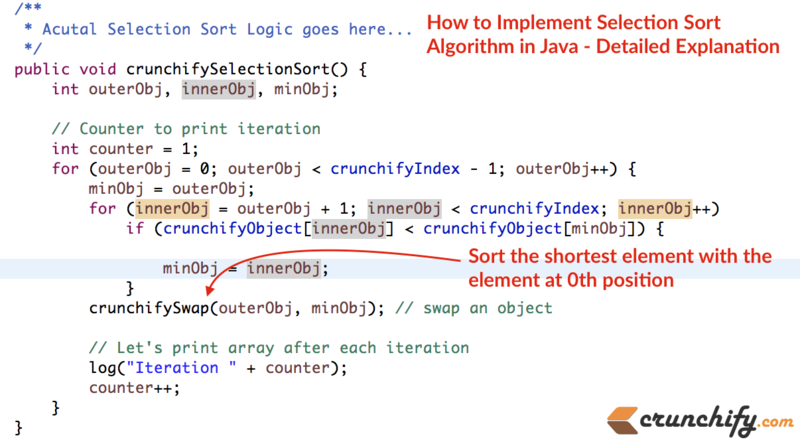 In this tutorial we will go over the best way to implement Selection Sort Algorithm in Java. After each iteration we will print result for you to get a better idea. Selection sort logic is very simple. Sort the shortest element with the element with the 0th position. Keep doing the same until you reach at the end. Here is a simple Java Program to Implement Selection Sort – Algorithm Implementation/Sorting/Selection sort. Let me know if you have any question on implementation of selection sort in java. Now the next questions would be what is a time complexity for above program? Well, the time complexity is O(n2).